See this meal? 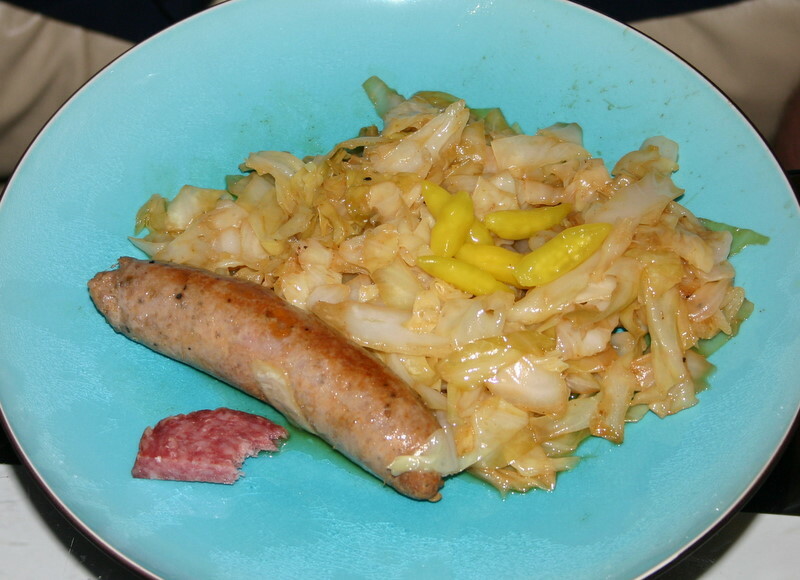 It's sausage and cabbage with vinegar in the quasi-Bulgarian style. (Quasi-Bulgarian? 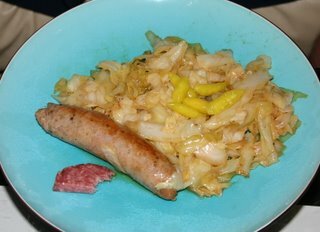 Well, Alex taught me this type of dish and told me it was Bulgarian, but in seven and a half years I've never seen another Bulgarian make anything like it.) Not fancy. Certainly not difficult. Oh, and the piece of salami and tabasco peppers were all Alex. But, this meal earned me a mushy moment. We were having a cold(ish) night last night, so I made this for dinner. Alex takes a bite and says "Good dinner, woman. If all wives made dinners like this the divorce rate would be lower." There's a pause here while we both absorb what he just said. (Me: Aww - how sweet. Him: Ugh, how corny.) And then he says "By at least .2 or .3%." Yeah. We agreed I would just ignore that part. That way we can both be happy. I get to keep my mushy compliment, and he gets to keep his not corny self-image. Don't worry; I won't get used to the mush. He still takes delight in driving me crazy. Not an hour later he invented a new game that entertained him greatly and tortured me. We typically lie down while watching TV, and our two couches are perpendicular. Every so often he'll reach his hand out for me to take it, and we'll hold hands for a few minutes. It substitutes for actually sitting together while we watch a show. (And that's pretty cheesy in itself, now that I write it down and everything.) So, after dinner last night, we were watching TV and he put his hand out, but when I reached for it he pulled his hand back. He did this five or six more times in a few minute period. When I refused to reach for his hand anymore, he whined in a little kid voice that I was supposed to hold his hand, I was his wife, if I really loved him, etc. etc. And when that game just got a roll of the eyes he paused our show at a commercial and proceeded to rewind and play the commercial a good dozen times... Yeah. And my efforts to make him stop probably would work better if he weren't so silly that I'm laughing even as I tell him to knock it off. Last night he decided to actually stop BEFORE I had moved from laughing to truly angry. Just another Tuesday night with the Dobrevs.